The 2019 Chevrolet Silverado 2500 HD is a three-quarter ton work truck that gets only minor changes from the 2018 model before it gets a bigger update for the 2020 model year. It is available in regular, crew and double-cab configurations with both long and standard beds. The 2019 Chevrolet Silverado 2500 HD is built on GM’s full-size K2 platform, which is shared with the GMC Sierra HD. The 2019 Chevrolet Silverado 2500 HD starts at $37,500 plus a $1,495 destination charge. The top-of-the-line High Country trim can reach over $73,000 before any dealer-added accessories. The 2018 Silverado 2500 HD started at $34,400 plus a $1,395 destination charge. The 2019 Chevrolet Silverado 2500 HD is available in four trims: WT (work truck), LT, LTZ and High Country. The top-of-the-line High Country trim is available on Crew Cab models only and comes with 20-inch chromed-aluminum wheels, heated and vented custom leather-appointed front seats, a 6-inch chrome assist step and a Bose premium audio system. 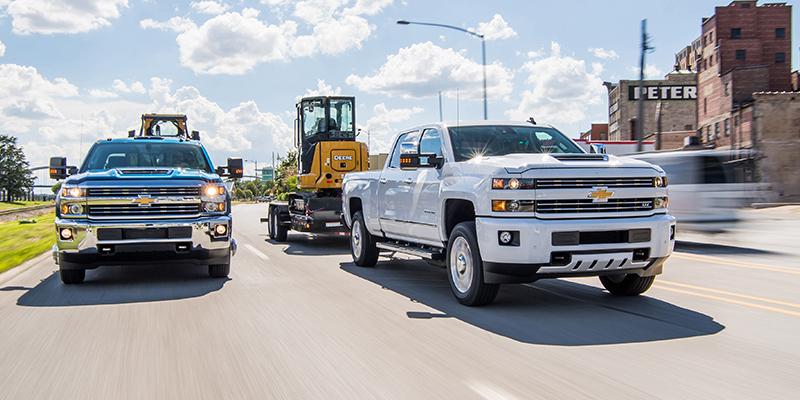 All 2019 Silverado 2500 HD trucks are covered by a 3-year/36,000-mile limited bumper-to-bumper warranty and a 5-year/50,000-mile limited powertrain warranty. Four-wheel drive and two-wheel drive are available. 17-inch aluminum wheels are standard on the LT trim, with 18-inch and 20-inch chromed-aluminum wheels available as options on higher trims. The dimensions of the 2019 Chevrolet Silverado 2500 HD vary depending on options. The crew cab with standard box has a 153.7-inch wheelbase, a 239.5-inch overall length and an 80.51-inch width. The long box crew cab has a 167.7-inch wheelbase, a 258.4-inch length and an 80.51-inch width. There are three engine options for the 2019 Chevrolet Silverado 2500 HD. These include a 6.0-liter Vortec V8 that can burn either gasoline or gaseous LPG/CNG. The third option is a 6.6-liter V8 Duramax diesel. The 6.0-liter Vortec V8 produces 360 horsepower and 380 pound-feet of torque when running on gasoline. It is also FlexFuel E85-capable. Adding the LPG/CNG option costs $300 and removes the E85 capability. The 6.6-liter V8 Duramax diesel engine produces 445 horsepower and 910 pound-feet of torque. It is also B20 diesel-compatible. The 2019 Chevrolet Silverado 2500 HD uses a six-speed automatic transmission with tow/haul mode and Auto Grade Braking to reduce the amount of conventional braking needed while towing or driving downhill. The maximum towing capacity for a 2019 Silverado 2500 HD is 15,400 pounds. This requires a fifth-wheel hitch and Duramax 6.-liter Turbo-Diesel V8 engine. EPA fuel economy numbers are not required for heavy-duty trucks like the 2019 Silverado 2500 HD. In a Consumer Reports test, a 2017 Silverado 2500 HD was rated at 14 mpg overall. All 2019 Chevrolet Silverado 2500 HD models are equipped with six standard airbags. The specifics change depending on the cab and box configuration. The crew cab has single-stage front and seat-mounted side-impact airbags for the front seats, and dead-curtain airbags for front and rear outboard seats. The double and regular cab with pickup box configurations have a single-stage front airbag for the driver and a dual-stage front airbag for the front passenger. The front and rear passengers have seat-mounted side-impact and head-curtain airbags. The double and regular cab with pickup box configuration has single-stage front and seat-mounted side-impact airbags for the front seats and head-curtain airbags for the front and rear seats. Standard safety equipment also includes a rear-vision camera, OnStar and Teen Driver mode. Optional safety and driver-assistance technology includes forward-collision alert, front- and rear-park assist and lane-departure warning. The standard infotainment system in the LT trim uses an 8-inch color touch screen, AM/FM/SiriusXM Bluetooth system compatible with Apple CarPlay and Android Auto. The six-speaker system also has USB and an auxiliary port for portable media devices. Navigation and a six- or seven-speaker Bose sound system are standard on the High Country trim and available on the LTZ trim. A rear-seat Blu-Ray/DVD entertainment system with two USB ports is available. A front 40/20/40 split-bench cloth seat is standard on the LT trim, with heated seats available. Leather-appointed, heated front bucket seats are standard on the High Country trim, which includes 10-way power adjusters, including two-way power lumbar control. Remote keyless entry, steering wheel audio controls, an auto-dimming rearview mirror and 4G LTE WiFi hotspot capability are standard on all trims, with remote start and a heated steering wheel available. Editor’s note: All photos courtesy of Chevrolet.